You may have heard of kung fu, but the girls at Oarai High School practice gun-fu—really, really BIG 75mm gun-fu, in fact. It's called Sensha-do, and it's the martial art of operating armored tanks! They take it seriously too, and since winning the national Sensha-do championship is such a huge deal at Oarai, they sometimes go to extreme ends in order to get the best students from Panzer class to sign up. 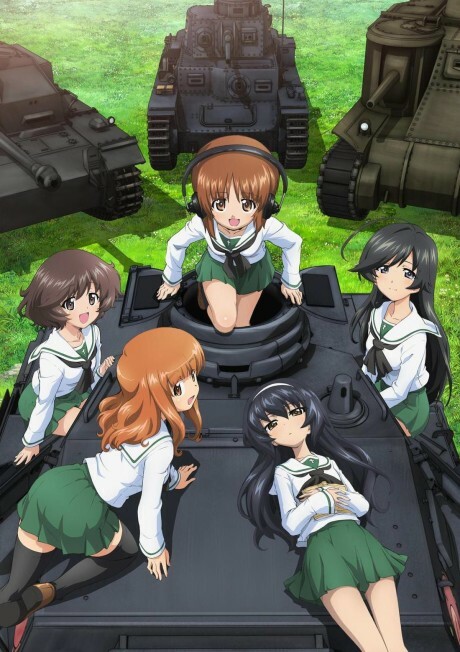 Which is how Miho Nishizumi, who HATES operating tanks, gets drafted to join doomsday-driven driver Mako, even-triggered gunner Hana, highly receptive radio operator Saori and combustible tank-fangirl and loader Yukari as the incomparable Anko Team. They may not be on the half-track to fame and fortune, and maybe a few of them would rather shop for tank tops than become tops in tanks, but once their focus is locked and loaded, they're absolutely driven. Episode 2 - Tanks, We Ride Them! Episode 3 - We're Having a Match! Episode 4 - Captain Does Her Best! A fun watch for casual fans, a masterpiece for historians. It's by no means a masterpiece, but it still had every excuse in the book to not be as great as it is.